After watching so many films, I have gradually found that it takes a lot of action and good fight scenes to impress or even thrill me. 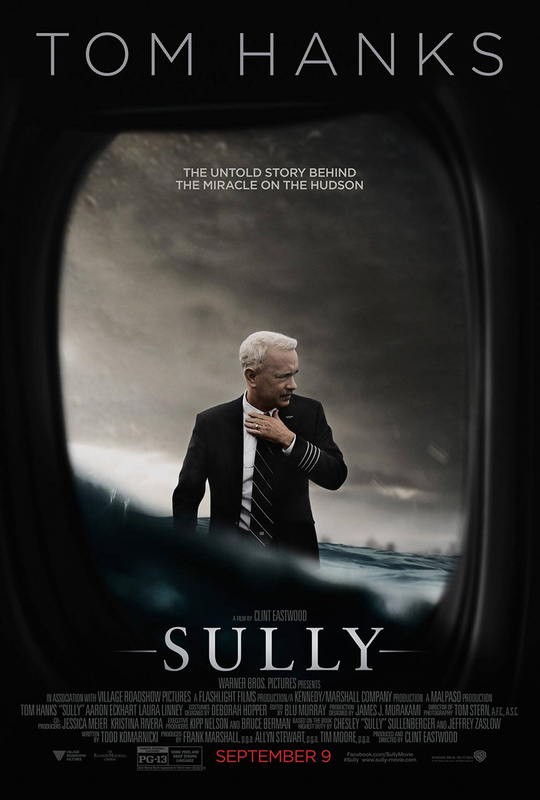 Sully’s one film which managed to keep me captivated without action. The movie has surprised me (and most audience) with their opening scene by starting the film with the aftermath of the incident rather than in a chronological order. The PTSD (Post Traumatic Stress Disorder) symptoms were brought forward as the main concern of the film, and these added a mysterious veil of the what-seems-to-be-highly-reported incident. It hooked the audience almost immediately, and for those who didn’t know the full story of the flight (like me), you would be intrigued to know what’s going on. I love the way repeated and similar flashbacks were used and yet not bore the audience. Rather than portraying Tom Hanks under a good light, the repeated self-doubt and hallucinations made the audience wonder if Sully’s decision to land on the river (despite zero casualty) was really the correct one. There were news about how the NTSB (National Transportation Safety Board) was villain-ised in the film. I saw it different. Sully had mentioned (more than once) how they were doing their job. The questions were necessary and scenario was required to be scrutinized to justify their actions. The reiterations of the simulated flights became both nerve-gripping and amusing at the same time, making the whole situation very personal and real. While most of the other characters play supporting (and a little insignificant) characters to this film, Tom Hanks was flawless. Check out what some of the real survivors of the event thought of the film “Sully” after watching it. This film is based on the autobiography “Highest Duty,” co-written by Chesley Sullenberger and Jeffrey Zaslow, about the safe landing of U.S. Airways Flight 1549 known as “Miracle on the Hudson” that occurred on Thursday, January 15, 2009. The airplane lost engine power, after hitting a flock of Canada Geese during climb-out at approximately 2800ft AGL and 200 nautical miles per hour. Each of the two engines ingested at least two Canada Geese (average weight between 7-10lbs.) and neither engine was able to produce sufficient thrust to sustain flight afterwards. Captain Sullenberger was able to ditch the aircraft in the Hudson River, resulting in the survival of all on board. The aircraft used in this film is an Airbus A320-200. The production bought two retired Airbus A320s that were used. This is the second time Tom Hanks has portrayed a real-life person where the events took place in the year 2009. He previously portrayed Captain Phillips in 2013, who was taken hostage by Somali pirates in April 2009. The events in this film took place in January 2009. It is also the second time Tom Hanks has played a real-life aviator, having also played astronaut Jim Lovell in Apollo 13 (1995). The biplane that Sully is training on in the flashback scene is a very rare Stearman Cloudboy, one of just six still flying at the time the movie was made. Katie Couric, who interviews Captain Sullenberger (Tom Hanks) in the film, also interviewed the real-life pilot Chesley Sullenberger for 60 Minutes (1968). The segment “Saving Flight 1549” aired on February 8, 2009, a mere twenty-four days after the tragic event. To create the post-crash scenes in the river, the producers first shot footage of the rescue boats, surrounding a large empty space, in the Hudson River. Crash landing rescue scenes were filmed at the same Hudson River location where the actual survivors were recovered. Despite several scenes depicting interaction between Sully and his wife Lorraine, Tom Hanks and Laura Linney never had any actual screen time together. They were always shown talking on the phone. Laura Linney claimed that despite not sharing any screen time with Tom Hanks, they were genuinely on-line with each other during the filming of the phone conversations. Tom Hanks spent half a day with Chesley Sullenberger at his Bay Area home during pre-production. Sullenberger said he was impressed by how well the actor caught him. Ferry Captain Vincent Lombardi, who was the captain of the first ferry to reach the plane, played himself in the movie. The song “A Real Hero” by French electronica artist College, in collaboration with Electric Youth, released in 2010, is about Captain Chesley Sullenberger and the U.S. Airways Flight 1549 water landing incident. Electric Youth frontman Austin Garrick was inspired to write the song by a quote from his grandfather, who spoke of Sullenberger and the incident. Garrick’s grandfather referred to Sullenberger as “a real human being and a real hero,” which became the song’s refrain. The song was featured in Nicolas Winding Refn’s film, Drive (2011), and in Taken 2 (2012), starring Liam Neeson. Check out Sully Official Website and Facebook Page! Sully is out in cinemas on 8 September 2016. Oh, I love Tom Hanks, he is a good actor of all times. I will watch this movie soon. I am so excited for this, what a nice review! Tooooom Haaaaaanks!!!! And yeah! Been looking forward to watching this one. One great TH fan here! Tom Hanks means quality movies! The storyline is so captivating. I don’t know why I have not watched it yet. Must watch looks like. Well, I don’t have question when Tom Hank is an actor in the movie cause I know he would nailed it. This is a good movie to watch and will include this to my list. I can watch any Tom Hanks movie without considering anything. Big fan here! Good to know that you like the movie. Well, I have not heard about this movie but the story line is quite interesting and cast is nice too. Tom Hanks a different look here. It would be nice to see how he did justice to the real life role.